Holy Roman Emperor King Charles V visited medieval Brussels in 1549 with hundreds from his Royal Court. 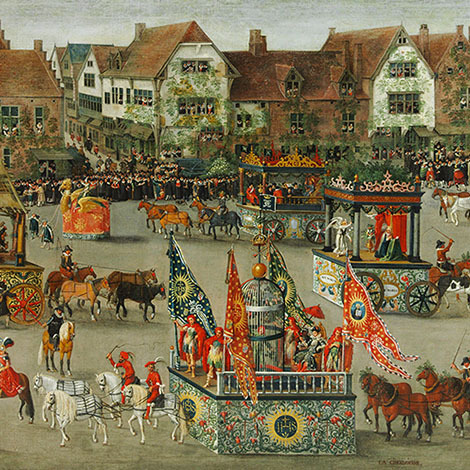 To welcome the King, merchants, vendors, cooks, brewers, musicians, theater troupes, dancers and more lined up around the city walls and joined in a celebration as his entourage passed by. That parade became known as the “Ommegang,” a word that variously means “coming together” and “walking about.” The Brussels Ommegang Festival continues to this day.